Space can be variously represented in a work of art. The depiction of quantifiable and verisimilar space has slowly become an important aspect in cinema and literature. With the rise of urban spaces and capitalism, space ceased to be abstract as in romances and has turned into a sort of referent of the ecology and economy that is represented. In this way, cities are being occupied by histories (real and fictitious, past, present and future): great locales of literature like London or New York are infested with the ghosts of Poe’s mysteries or Whitman’s democratic vision of society. In the same way, the Meccas of cinema are occupied, reinterpreted and transformed by artistic representation. In Los Angeles Plays Itself (2003) Thom Andersen reflects on the various means of representation of the city in film. As a local resident of L.A. Andersen looks to rebate filmic misconceptions and misrepresentations of the city. Los Angeles has obviously been the scenario for a myriad of motion pictures. “They film it because it’s there”, affirms the narrator in the film. But it has also attained definite semantic contours. It is conventionally considered an ugly city, and this is the reason why is often filmed from afar. This panorama vision blurs the reality of the middle class citizen who, unlike the clichéd character crossing the city in cars, actually walks or even uses the public transport. But I’m getting ahead of myself, let’s get back to the film. 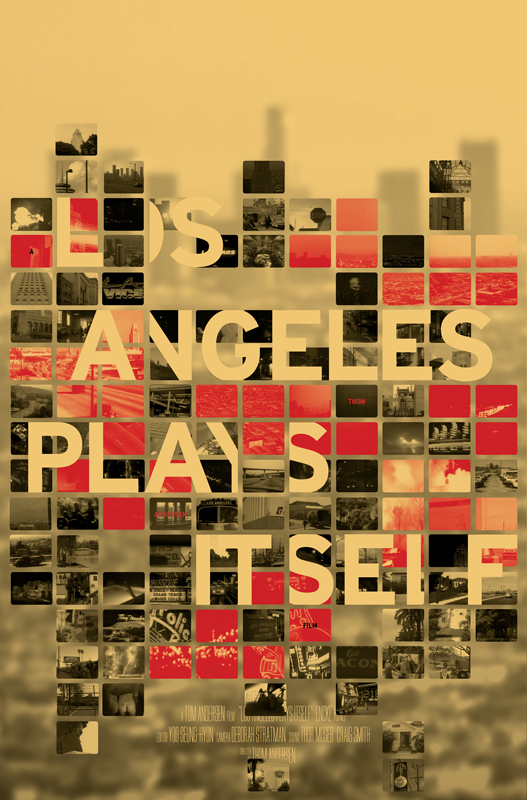 Los Angeles Plays Itself is a three-hour documentary film basically consisting of clips and film footage from other films, which take place in or have Los Angeles as its subject. The clips are accompanied by a voice-over narration offering an analysis and criticism of the films. Here, however, I am interested in commenting the use of space from a different perspective. Andersen refers the use of Los Angeles as superficial background in films like Woody Allen’s Annie Hall; as subject, recounting or actually reconceptualising the city’s history as in China Town; he talks about landmarks that are usually destroyed in apocalyptic movies, of public spaces that are reinterpreted in different films…. What Andersen is building here, apart from a filmic history and mapping of the city of Los Angeles, is a rhetoric of spatial practices in motion pictures. Michel De Certeau, the theorist of flaneurism in the city, has argued the existence of a rhetoric of walking, legible not only in the tracing of steps in maps but also in the (un)conscious manipulation of urban “spatial organizations”. Decisions like walking on this avenue or the back alley are variously determined by “social models, cultural mores [and] personal factors” (101). An interesting parallel can be established between the rhetoric of walking and the use of space in films. A film maker is also moving in space but more importantly he is “making choices among the signifiers of the ‘spatial language’” (99) Destroying certain buildings and landmarks, filming people walking, taking the bus, staging the action in a certain neighbourhood are of course signs of a language with which every city dweller and film spectator has become conversant and that filmmakers have come to master.